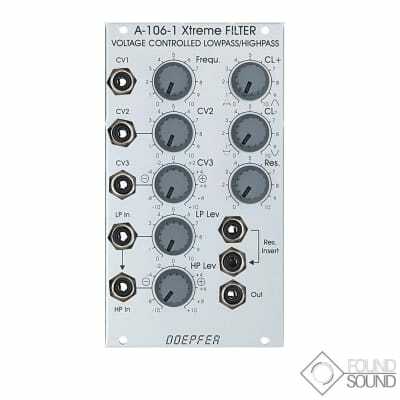 Module A-106-1 has its origin in our experiments to built a MS20 filter clone. 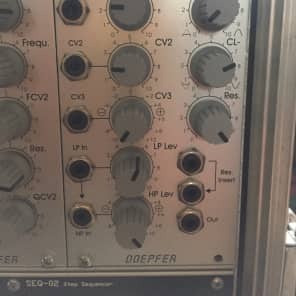 The famous original MS20 included two filters: a 12 dB lowpass and a 6dB high pass filter connected in series both with a very special design (the MS20 highpass is very often described as 12dB high pass, but this is not true). During our research we found a way to use the same circuit simultaneously as lowpass and highpass for 2 different audio signals (a bit similar to the A-101-1 Steiner Vactrol filter that has even different audio inputs available, but with the special MS20 circuit). For this two separate audio inputs for lowpass (LP) and highpass (HP) with separate level controls are available. The sockets are normalled, i.e. the signal applied to the LP input is available for the HP input too provided that no plug is inserted into the HP input socket. The level control of the HP input is realized as a polarized input. This means that the signal can be added with the same polarity (+ range) or opposite polarity (- range) compared to the LP input. This feature enables notch (+) and bandpass (-) filter functions too. This design allows even some very special functions: It is e.g. possible to adjust the controls so that the LP signal does not distort but the HP share does (or the other way round) - alternatively with the same or opposite polarity compared to the LP signal. For this the LP level has to be set to a small value so that the signal does not distort. The HP level control has to be set to a higher value (in the + or - range) so that the HP share will distort. The variety of controls allows a lot of functions that are not available for any other filter we know. On top of this the module is equipped with two frequency CV inputs. One is carried out as a polarizer. This means that effect of the external CV (e.g. envelope from an ADSR A-140 or A-141) to the filter frequency is positive (+ range) or negative (- range). Especially when the filter is moved from LP to HP it might be useful to invert the polarity of the envelope CV. We also have to mention that the frequency response if far from 1V/oct but rather non-linear. To obtain the filter section of the original MS20 two A-106-1 have to be patched in series (one in LP mode, the other in HP mode, both with CL+ and CL- set to zero).